There is a saying that goes something like this, “when life hands you lemons, you make lemonade…” Have you ever heard of it? I’m sure that you have. That sounds like a great saying, but have you ever wondered what is going on between the receiving of the lemons and the making of the lemonade? Well I have. I have wondered what the person is thinking and feeling. I have also wondered when it becomes clear that it is time to make some lemonade. While dealing with these thoughts, it may be hard to focus on the good, to wait for things to get better, or to even know how to feel. At times like this, I think it might seem easier to pretend. Upset and frustrated, I have often looked at a situation without knowing what to do or how I was supposed to feel. Naturally, I am an optimist. Still there are times when I cannot see the bright side and I feel lost. It is at these times that I start to wonder if it would just be easier to pretend that I am not going through anything at all. Pretending means that you get to ignore the situation. You don’t have to talk about it, think about it, or acknowledge anything is happening at all. However, this does not magically stop us from feeling the stress and emotions of the situation. In fact, I think it would make it worse. By pretending, we would be telling ourselves that the situation did not occur the way that it did. We would also be denying ourselves the right to feel the way we do about what occurred. Denying ourselves of our emotions is not wise because acknowledging our feelings allows us to process situations. Processing the situations, stimulates growth in our lives. There have been many times when I have wanted to stop thinking about a situation. I have wished that it never happened. I have also tried to ignore my feelings about it all. The result is…well ugly. When I have tried this in the past, I have become very nonchalant and emotionless about various aspects of my life. 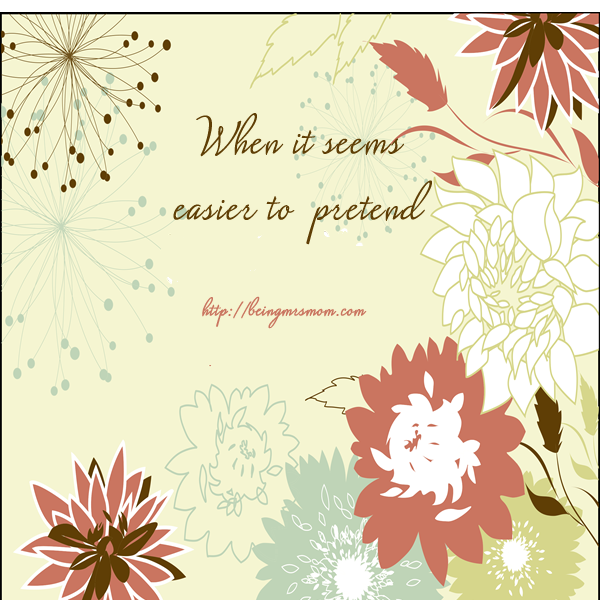 It is as if ignoring the situation allowed a totally different process to start in my life…I became cold and despondent. Generally, that is not me. I care, I feel, I wonder. Yet, ignoring situations and my feelings about situations change me. When I allow myself to see the situation, no matter how painful, I feel the emotions attached to it; when I feel those emotions, I process them. In processing them, I begin to learn from the situation. Learning from situations offers wisdom and helps me to trust in God. I realized that the tribulations, no matter how big or small, make me better. They encourage me to a place of being better and hoping in God more. Now do you see why it is never good to pretend. We don’t have to treat others badly and act in a way that is unbecoming, but we should recognize the tribulation and allow the process of feeling, becoming, and overcoming to take place in our lives. Today, I want to encourage you, as I have been encouraged myself. We have been given some lemons and it’s time to make some lemonade. Sometimes, you may not know how to feel, what to think, or how to act, but continue to trust God. He knew what would happen and He has something great prepared for you in the end. Recognize how the tribulation produces perseverance in you. Take note of how the perseverance produces character in you. Understand how the character produces hope in you. When it is all said and done, look back and see how you are better and the hope that you have in God has not failed you. Remember that it never will. I hope you have found this helpful and that you will remember these things. Until next time…don’t pretend and be blessed.